2nd the Best: Arrrr! Me Treasure! I'm home today with my poor little baby boy who is sick...he has an ear infection, pink eye, and a terrible cough. I guess one plus to me working and him being in daycare is that he will have a strong immune system by the time he gets to kindergarten. I was in mommy mode all weekend so I didn't have a chance to post anything new. He is napping now and I actually have a pretty clean house thank you to my wonderful husband who scrubbed the den and kitchen yesterday while I took care of the baby. He even rented a carpet cleaner and cleaned all the carpet. I am not sure what got into him, but I like it!!! Anyways...as the school year comes to an end I am noticing a few of my second graders are still struggling with counting coins. So I've been working on a few games for them to do during math workshop. Click on the pirate below to download the game. ARRR! Me Treasure! A Coin Counting Game. P.S. 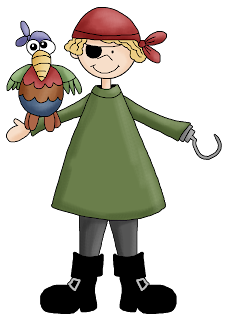 I am working on putting all my pirate theme ideas into one document so keep an eye out for it...I will post it on here (for free) as soon as it's done! Your newest follower! I look forward to your posts and hope your little one feels better soon! What a great idea! Thanks for sharing this awesome activity and printable. My son loves pirates and we're working on coin counting, so this is perfect!! Your newest follower from Math Monday. I'd love to have you stop by my site sometime (www.deceptivelyeducational.blogspot.com)!